The Camino is a 1,000-year-old pilgrimage trail with different starting points all over Europe. The end target is the same—the Cathedral in Santiago, Spain, where the bones of the apostle Saint James are supposedly buried. Along the way, you’ll get many opportunities to ask yourself: “Why?” My husband, Evan, and I found it took hiking up hills in the rain on slippery stone paths, trudging along ancient Roman roads in 38-degree temperatures, or trying to find our beds in a room of 50 snoring fellow pilgrims to even begin to comprehend why anyone would do such a physically demanding holiday. We began our Camino in the medieval French town of Le Puy-en-Velay, one of the original starting points. We planned to walk 25 km a day (we ended up walking 28), which would get us across France, over the Pyrenees, and into Santiago near the west coast of Spain in 10 weeks, each of us carrying a small backpack filled with the bare minimum of clothes and toiletries. Did I train? A bit, but I just assumed the first week would be a tough slog. It was. 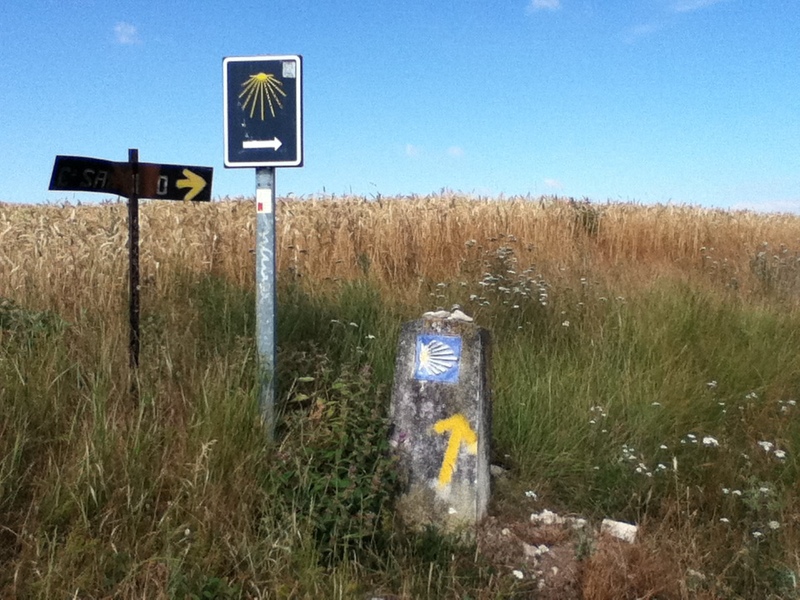 It took nine days of throbbing legs and aching feet before my body got into the Camino rhythm. What I hadn’t realised was that my feet would be sore at the end of every day of our trip. When we live an urban life our feet aren’t in shape to take the pounding, climbing, sliding, and stumbling up—and down—mountains, through rocky stream beds, and on long stretches of stone or asphalt roads for six- to eight-hours a day, week after week, for 2 ½ months. Every day brought new experiences. We arrived in Espeyrac soaking wet after walking hours in the rain only to discover the community gite (hostel) no longer served meals. The grocer had recently died, and the only store in town was closed, so we set out what food we had for our supper: a piece of farmer’s cheese, part of a very tough sausage, a chunk of three-day-old baguette, and a sliver of dark chocolate. On the Camino, you acquire an appreciation for food. Bits and pieces can become a gourmet meal when you’re hungry. Day after day we walked through golden wheat fields, between long rows of grape vines, or alongside thousands of yellow sunflowers visible as far as the eye could see. Some paths lead us on misty wooded trails that had sunk below ground level, worn down by millions of feet over 1,000 years. The downside is that the day after day experience of walking—with many of the hours in silence—gives your brain lots of time to chatter, to dig up moments of unfairness or sorrow, and to re-experience emotional memories. There is nothing like climbing mountain trails in thunderstorms and trudging on deserts in sweltering heat to have each day consist of a roller-coaster of joy, despair, tears, awe, pain, and laughter. On our fourth week, we turned a corner on a high country road and saw the high mountain peaks of the Pyrenees in the distance for the first time. It was an emotional moment; we were now almost halfway to Santiago. The next big town was Saint-Jean-Pied-de-Port, located at the base of the Pyrenees. It is also the beginning of the trail for the majority of Camino pilgrims and hikers. I had been worried about hiking over the Pyrenees and was relieved to find that although it was physically challenging, the fact we had already hiked 760 km meant we were in good shape and could enjoy striding through wild grass-covered mountain meadows and looking down into the valleys below. We passed herds of free-ranging horses, flocks of sheep, a goat in labour, and eagles flying parallel to us. Arriving in Roncesvalles, Spain, on the other side of the mountain range, was a shock: a different language, different food, and instead of a 10-person hostel, the newly renovated refugio can hold over 200 pilgrims when necessary. The next big challenge was the Meseta, an eight-day desert hike between Burgos and Leon. Day after day you put one foot in front of the other across flat, dusty, arid land. Guidebooks describe this section as having driven people mad, and those scary tales resulted in some hikers taking the bus to avoid it. Evan and I found it hot, dry, and treeless but all I can say is that anyone who complained about it has never been to Saskatchewan in July. We finally arrived in Santiago 70 days and 1,600 km later. Evan and I were in a daze. This was it? Was it over? Now what? Unlike the medieval pilgrims, we didn’t have to turn around and head back the way we had come, but we both felt the need to end our journey with a ritual of some kind. 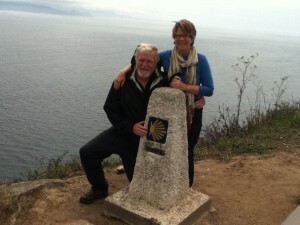 After attending the Pilgrim’s Mass in the Santiago Cathedral, I took a bus to Cape Finisterre on the coast. Purist Evan insisted on walking those extra 100 kilometres. It was only when my tired and painful bare feet sank into Finisterre’s sandy beach and were covered by a cold Atlantic Ocean wave that I felt our walk was over. We’re still trying to sort out our experiences. The Camino was a challenge for us as a couple and for our bodies, but we returned having lost weight and with our feet, knees, and marriage intact. If any of you have considered the possibility of walking this ancient pilgrimage trail, I’d say “Do it!” Don’t worry about “why”. You’ll find that answer along the way. Evan and I are getting ready to head over to Europe again for several months for more hiking, including doing the two week Camino deviation Rocamadour route. 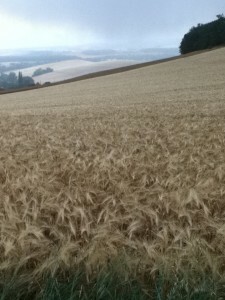 Has anyone out there done this Figeac to Agen hike? This a long shot but looking to talk to people who have done very long walks. My plan for 2016 is a 500 klms walk through Ireland called the O’Sullivan March. I am 60 so need to do this walk in the next few years. I hope to do it in 4 weeks and will not be camping and not carrying my luggage. Do you think a hike like this is possible. Check out the hike on Google.